In 1974, Lucy, a 3.2-million-year-old Australopithecus afarensis, made her debut—or at least her skeletal remains did, with an age determined by radiometric dating. A. afarensis may represent one of the earliest members of the hominid species, the human branch of the evolutionary tree. Unlike other anthropological findings, where fossils or a few bone fragments have been discovered, this one finding represented 40 percent of an entire skeleton. Based upon the size of the pelvic opening, it was inferred that these were the remains of a female; she was 43 inches (3.1 meters) tall and weighed ~ 66 lbs (30 kilograms). For many years, Lucy’s skeleton was exhibited in well-publicized tours in the United States, and in 2013 the remains were returned home. A plastic replica and related artifacts are now displayed in the Ethiopian capital, Addis Ababa, at the National Museum of Ethiopia. Examination of the pelvic and leg bones led to the conclusion that Lucy was bipedal, while the capacity of the cranial cavity was comparable to that of an ape, around one-third the size of modern humans. This has led scientists to conclude that bipedalism preceded an increase in brain size during human evolution, a view that is contrary to what was previously believed. Some researchers have questioned whether Lucy and A. afarensis are, in fact, ancestors to modern humans. Among other remains found, most in the same area of Africa, there is no evidence that A. afarensisused shaped tools or fire. SEE ALSO: Primates (c. 65 Million BCE), Neanderthals (c. 350,000 BCE), Anatomically Modern Humans (c. 200,000 BCE), Radiometric Dating (1907), Oldest DNA and Human Evolution (2013). 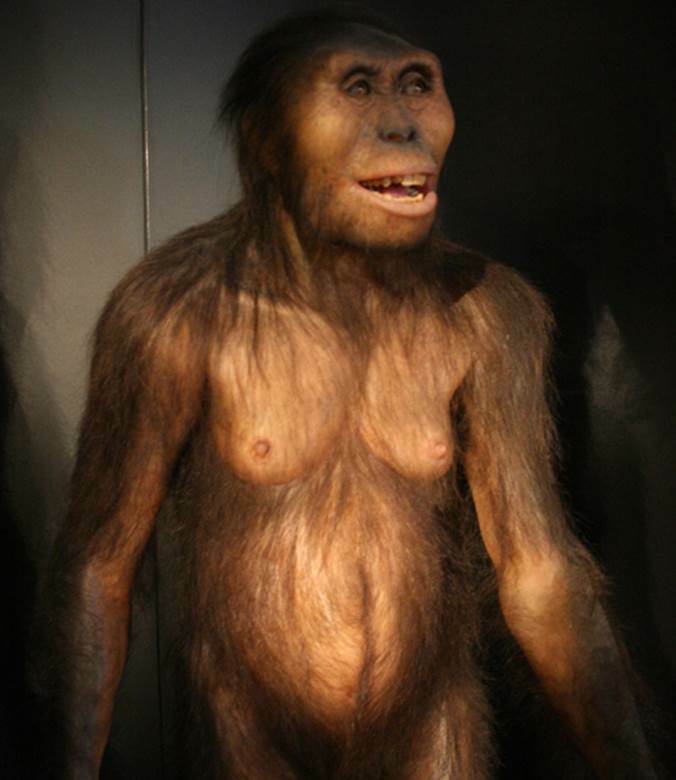 A reproduction of Australopithecus afarensis, one of the longest-lived and (thanks to Lucy) most well-known early human species. Remains found in Eastern Africa date back to 3.85–2.95 million years ago, suggesting that this species survived more than 900,000 years—almost four times as long as Anatomically Modern Humans thus far.